Background: Mycobacterium tuberculosis, Vibrio cholerae, and pathogenic Escherichia coli are global concerns for public health. The emergence of multi-drug resistant (MDR) strains of these pathogens is creating additional challenges in controlling infections caused by these deadly bacteria. Recently, we reported that Acetate kinase (AcK) could be a broad-spectrum novel target in several bacteria including these pathogens. 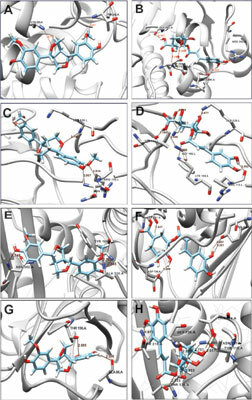 Methods: Here, using in silico and in vitro approaches we show that (i) AcK is an essential protein in pathogenic bacteria; (ii) natural compounds Chlorogenic acid and Pinoresinol from Piper betel and Piperidine derivative compound 6-oxopiperidine-3-carboxylic acid inhibit the growth of pathogenic E. coli and M. tuberculosis by targeting AcK with equal or higher efficacy than the currently used antibiotics; (iii) molecular modeling and docking studies show interactions between inhibitors and AcK that correlate with the experimental results; (iv) these compounds are highly effective even on MDR strains of these pathogens; (v) further, the compounds may also target bacterial two-component system proteins that help bacteria in expressing the genes related to drug resistance and virulence; and (vi) finally, all the tested compounds are predicted to have drug-like properties. Results and Conclusion: Suggesting that, these Piper betel derived compounds may be further tested for developing a novel class of broad-spectrum drugs against various common and MDR pathogens. Infectious disease, Multi-drug resistant, Natural compounds, Piper betel, Tuberculosis, ACK.